The art group General Idea emerged in Toronto’s counterculture scene in the late 1960s. By the early 1970s, the group’s membership was solidified, encompassing Felix Partz, Jorge Zontal, and AA Bronson. Best known for their provocative conceptual works, General Idea took on popular culture formats from beauty pageants to television and engaged in a range of media not limited to painting, photography, mail art, performance, video, and installation. They are perhaps best remembered, though, for their work addressing the AIDS crisis. The AIDS pandemic shaped their practice from 1987 to 1994, a period that ended with the deaths of Partz and Zontal from AIDS related causes. Given the broad scope and influential legacy of General Idea, the Art Canada Institute has commissioned a new book exploring the group’s history. Part of the ACI’s series examining major Canadian artists, the book looks at the group’s founding, its major exhibitions, and its influence on later artists. What is really unique about the book, and ACI’s series generally, is that it is an entirely digital publication. This format is particularly useful in art history, where the visual is so important. 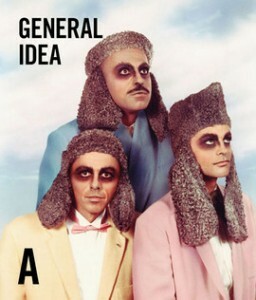 The book includes photos and videos of General Idea’s artwork, which allows the reader to fully engage with the material. Rather than have the book describe the art, the digital format allows the art to speak for itself. In this episode of the History Slam, I talk with the author of General Idea: Life and Work, Sarah E.K. Smith. We talk about the differences between traditional history and art history, the legacy of General Idea, and the challenges and benefits and digital publishing. If you’re in Toronto on May 19, the Royal Ontario Museum is hosting Inventing History and Making it Real, where Sarah will be in conversation with AA Bronson and Luis Jacob.